To be completely honest, I don’t even know what the exact definition of a foodie is, although you’ll often find me claiming to be one. Urban dictionary had way too many varying explanations, so that didn’t help much either. I do know that the real star is the food. 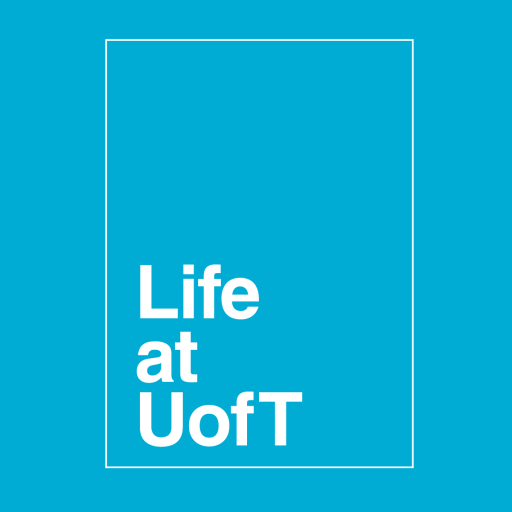 Which is why I recently wrote a post about making your own food, or trying some of the great food that U of T has to offer. What I like to keep in mind though, is that I’m here for about 4 years. I don’t plan on making couscous every day when some of the best places to eat are just off campus. Being in the heart of downtown Toronto, I always like to try out what our amazing city has to offer! It’s all a part of the student experience, right? I’ve spent many a study session abandoning my books and going for walks around the outskirts of our campus, and I’ve found some really great places. Here are a few of my favorite eateries so far! Millie Creperie near Spadina and College – This one was a fairly recent find. A friend and I decided to walk around the area and we found this place tucked away in Kensington. 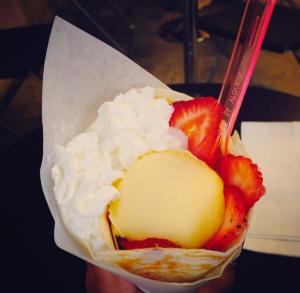 The crepes are served in this little cone, which doesn’t make it any easier to eat, but makes it cuter to look at! Banh Mi Boys near Queen and Spadina – I found Banh Mi Boys during my Toronto staycation and although it’s probably the furthest spot from U of T, it’s definitely worth the walk! I never realized my love for Vietnamese food until I came across this place! Must-try: I’ve said it before; I’ll say it again. 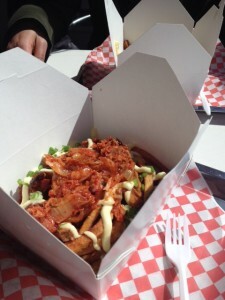 Kim-chi fries! Dlish Cupcakes near Yonge and Bloor – Dlish does amazing cupcakes. 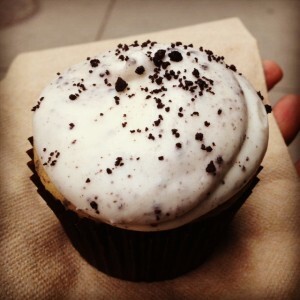 There are so many flavours to choose from, and it’s conveniently close by to campus in Yorkville. #classy. So that was my foodie adventure (so far). 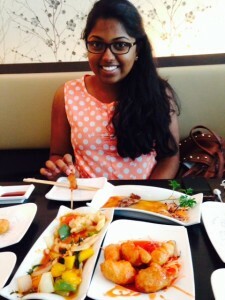 So tell me U of T, what are your favourite off-campus places to eat?